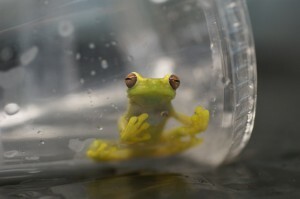 The Panama Amphibian Rescue and Conservation Project announced on December 4th, 2009 that some of the frogs collected in their inaugural expedition in November were already affected by amphibian chytrid fungus (Batrachochytrium dendrobatidis), the disease that has devastated nearly 100 frog species worldwide. The purpose of the Project’s first expedition was to collect living specimens of frogs not yet affected by chytrid fungus in Panama for captive breeding. The rescue mission, led by the Dr. Roberto Ibanez and Edgardo Griffith with support from all of the partners, collected approximately 20 harlequin toads (Atelopus limosus) and 20 treefrogs (Hyloscirtus colymba) under brutal field conditions at the peak of the rainy season from Cerro Brewster in Panama’s Chagres National Park. These two species will be kept at the Summit Municipal Park in Panama while other rescued species were taken to the previously established El Valle Amphibian Conservation Center (EVACC). The EVACC was established in 2005 ago by the Houston Zoo and many other zoo partners in response to massive amphibian declines were witnessed in Western Panama by researchers and visiting scientists at the Smithsonian Tropical Research Institute. When the animals arrived at the rescue facility, several of the frogs were already showing signs of illness and many more developed signs in the following days. Investigation by the project veterinarians identified these animals to be infected with the amphibian chytrid fungus. Samples were further examined by Dr. Roberto Ibanez at the Smithsonian Tropical Research Institute and the chytrid fungus was confirmed. “Looking through the microscope and seeing the chytrid organism present on these animals with my own eyes was devastating. I knew this meant we were already behind. This meant that the animals we were treating could very well be the last members of their species unless we act fast to get back out there and save as many more as we can from the wild,” said Dr. Eric Baitchman, Director of Veterinary Services at Zoo New England. All animals collected began a 10-day treatment protocol to eliminate the fungus, which involves each animal being bathed in a medicated solution for 10 minutes a day. This is a standard protocol for animals that are collected from the wild, due to the risk of the amphibian chytrid pathogen, though this treatment was all the more vital once the organism was actually identified in these animals. Animals that are actively showing signs of illness also received intensive supportive care to help them survive through the course of treatment. The amphibian chytrid attacks the skin cells of amphibians, which can be quickly lethal for an animal that relies on its skin for the majority of respiratory function, hydration and electrolyte balance. Veterinary care for afflicted animals includes continuous fluid therapy to maintain hydration and replace electrolytes and antibiotic treatment to protect against other infections that may take hold after the loss of the skin’s protective barrier. The worst affected animals were unfortunately lost, but many animals are improved and are recovering today. The discovery of amphibian chytrid on the frogs at this site means that time has nearly expired for at least four species of frogs that do not live further east than Cerro Brewster and have been extirpated at all their other known sites. Responding to this news, the Autoridad Nacional del Ambiente (ANAM), Panama’s National Environmental Authority, announced it would join the Project, pledging $150,000 in support. The founding partners of the Project are Cheyenne Mountain Zoo, the Smithsonian’s National Zoo, Houston Zoo, Africam Safari in Mexico, Zoo New England, the Summit Municipal Park in Panama, Defenders of Wildlife and the Smithsonian Tropical Research Institute. These research and conservation organizations came together earlier in the year and pledged their support to combat the amphibian crisis in Panama. The project partners are collectively working to establish an additional amphibian conservation breeding center in Panama for critically endangered species that are in jeopardy of being eradicated by the chytrid fungus. 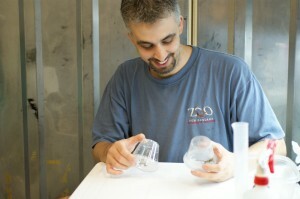 Houston Zoo and other zoo partners created a facility dedicated mainly to preserve endangered species of amphibian from Central Panama known as EVACC, a project lead by the Panamanian biologist Edgardo Griffith in 2005, and the additional capacity provided by this project is needed to focus on Eastern Panama. The Association of Zoos and Aquariums has challenged all AZA accredited Zoos and Aquariums to take a leadership role during this amphibian crisis. If this effort fails, one-third to one-half of the world’s amphibians could go extinct. This entry was posted in chytridiomycosis, ex-situ conservation, Rescue and tagged Atelopus limosus, Cero Brewster, chytrid, Hyloscirtus colymba, Rescue by admin. Bookmark the permalink.